Iran: Act Like a Man, Dress Like a Woman! A man dressed in a red dress with a veil on his head was paraded by security forces through the streets of Marivan in the Kurdistan province of Iran on Monday, April 15, 2013. A local court decided this would be the punishment for three men, reportedly found guilty in domestic disputes. The exact circumstances are unclear, but the mere idea of this punishment has angered many. Women in Marivan held a protest against the sentence on Tuesday, saying it is more humiliating to women than it is to the convicted men. According to one human rights activist, security forces physically attacked protesters [fa]. A video shows women marching through the streets. Online, several Kurdish men have photographed themselves dressed as women as part of a Facebook campaign to say, “Being a woman is not an instrument to punish or humiliate anybody.” The photos appear on a Facebook page named Kurd Men for Equality. Security forces dragged a convicted Marvani’s man in the city. They dressed him as a woman and wished by this act to humiliate him. The Women's Association of Marivan condemn this action and consider it an insult to women. Kurdish women protested against this act [one day after]. Iran’s judiciary has no right to order such punishment which goes against human dignity. Dressing convicts like women is not something you can find in the laws of the Islamic Republic. More than three years ago, Iranian authorities attempted to use the same method of humiliation against a student activist, but failed. Back then, Iranian authorities claimed that Majid Tavakoli dressed as a woman to escape after delivering a speech in Tehran on Student Day. 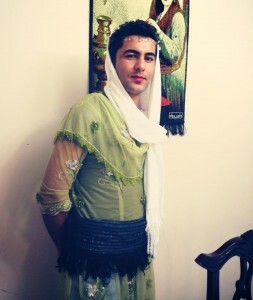 However, human rights activists in Iran published a report from an eyewitness saying: “All the pictures published by the state media are false and a clear use of immoral means against student and civil activists in Iran.” At the time, hundreds of Iranian men photographed themselves dressed as women in hijab to support Tavakoli.